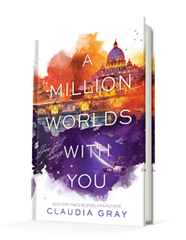 Published November 1, 2016, by HarperTeen A Million Worlds with You by Claudia Gray is the final novel in her Firebird trilogy. The final novel in the Firebird trilogy takes the main character Marguerite on an exciting adventure between universes for the final battle with her doppelganger to save the multiverse. As a series, this one has offered up so much character development and exciting adventure because Meg (as she’s nicknamed in the novel) is adjusting to traveling between dimensions. In this novel she is finally experiencing the ramifications of what she has done herself as her body is invaded, leaving her a passenger in her own body with no control over her actions. This is something Meg has caused in her own traveling. While the incident is brief, it leaves a mark on Meg as she finally understands the ramifications of the occurrence. However, that doesn’t stop her, it only leaves her more conscious of her actions, coming so far from the first novel where Meg was just on a journey to find someone. Things have escalated as the words become more aware of each other and she is the embodiment of that change because she has become more aware of who she is, more aware of her actions in all this. Meg has changed and grown up, she has become the hero of her own story, someone who must battle herself in her dark form, and that darkness is something so hard for her to face. It’s a genuine aspect of the novel that forces Meg to face herself. It’s challenging for herself to see herself in these circumstances, but it allows growth for her character and challenges her to face her own inner darkness. As far as the story goes, it also develops so well. While Meg is facing the ramifications of her own actions, she also has to save the multiverse from grieving parents who only want their daughter back. It’s fast-paced, it’s riveting, and the story moves in such a way to captivate the reader with amusement and sadness. It’s a beautiful way to tell the story filled with humorous anecdotes to breathe life into the story. Even at the end, the characters are still growing, they are still challenging the ideas that there is some darkness within themselves that must be challenged. However they never give up hope, they never give into the darkness, and that is a powerful aspect of the story, that darkness doesn’t have to govern a person. And that is what the story focuses on, the idea that there is a light within even the darkest of souls, that hope and love can save any individual. As fast paced as the story is, most of much is a cat and mouse game, there is still development for the characters and the story, there’s still room for it to grow, and keep growing as the universes become more aware of one another. Personally, that’s what I love about the novel, how it flows and moves through universe after universe and how it pits Meg against her darkest half, facing even the darkest parts of herself. It’s amazing how it just challenges the idea the anyone is wholly good without a shred of darkness and teaches how to accept that idea that even the smallest kernel of darkness exists within everyone but how it can be contained with love and hope and acceptance of that darkness. It’s such a powerful idea that can change the course of any person and it’s really the driving point of the story, and it’s a compelling point of the story, it’s a strong point of the storytelling that is both relatable and grounded. There is a sense of realism to it that every reader of any age can connect to, something that also inspires hope.